One of the extra-special pieces of the Unplugd experience was not only being able to spend some time around an actual campfire with #Ds106Radio fire-mate Giulia Forsythe, but being able to collaborate with her in preparing the second chapter of the summit publication, “Why _______ Matters: Voices and Choices.” In addition to being tapped to collect the various chapters’ themes and stories in visual representations and sketches, Giulia’s own essay, “Why Doodling Matters,” took the shape of a visual essay that continued to develop over the course of an afternoon on the couch in the Edge’s Points North cabin (though, to be fair, I disappeared before Giulia delivered a lengthier treatise on the wonders of iPad file storage and transfer). As Temple Grandin says, “the world needs all kinds of minds.” and some of those minds “think in pictures”. Doodling is a form of external thought that allows you to visualize the connections you are making while thinking. In the conscious mind, doodling can assist concentration and focus but even in the unconscious mind, while doodling and day dreaming connections are made. As Steven Johnson says, the “mind’s primordial soup” can lead to “serendipitous collisions of creative insight”. Doodling has allowed connections to be made between people and ideas, the magical space between. These aspects can lead to better problem solving. By sharing my thinking through visual means, my most important connections have been to people, by way of sharing my perceptions of their ideas, presentations and words back to them. Why Choice Matters: A Story Shared by Kathy Cassidy from unplugd on Vimeo. Why The Tools Matter: A Story Shared by Kim Gill from unplugd on Vimeo. Why Irresistible Challenges Matter: A Story Shared by Rodd Lucier from unplugd on Vimeo. Why Perspective Matters: A Story Shared by Andy McKiel from unplugd on Vimeo. 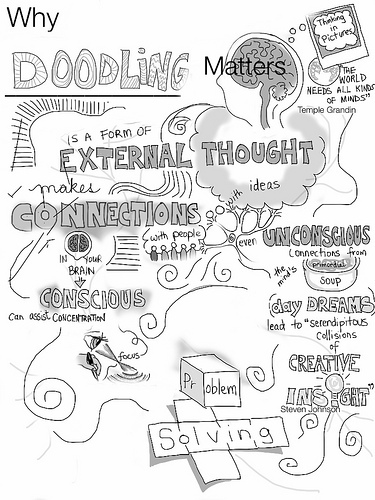 Bryan, I really enjoyed this post on doodling. It is absolutely true that doodling is a form of problem solving. I do this all the time when I have to think about something and cannot get it out right off hand. Often though, I am the only one that understands just what it is that I doodled!